Cell Advance is a complete antioxidant formula with 20 synergistic nutrients designed to prevent free radical damage in dogs. Cell Advance includes Vitamins A, C, and E; Coenzyme Q10 to promote cellular energy and immune system function; super oxide dismutase (SOD) to deactivate super oxides; glutathione peroxidase and catalase to protect against specific free radicals in combination with specific amino acids and minerals. When given to your dog on a daily basis, this supplement works effectively to remove harmful toxins and support the immune system. Ingredients like Coenzyme Q10 support your dog's health on the cellular level. If your dog is pregnant or may become pregnant consult your veterinarian before using Cell Advance. Do not use Cell Advance in conjunction with a blood thinner. 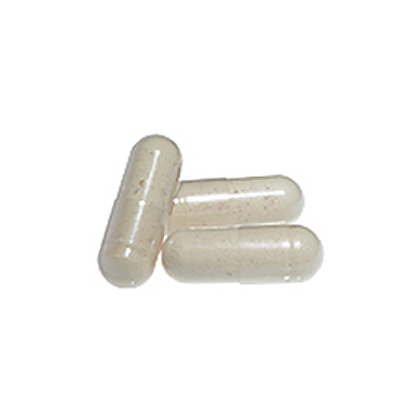 Ascorbic Acid (250mg), Vitamin E (75 IU), DL-Methionine Enteric Coated (25mg), L-Cysteine Enteric Coated (25mg), L-Glutathione Enteric Coated (25mg), Alpha Lipoic Acid (20mg), Magnesium (18.75mg), Beta Carotene (5.250 IU), L-Lysine HCl (12.5mg), Pyridoxine HCL (10mg), Hesperidin (10mg), Rutin (10mg), Catalase Enteric Coated (2,500 Units), Zinc (7.5mg), Vitamin A (1,000 IU), Super Oxide Dismutase Enteric Coated (1,250 Units), Quercetin (5mg), Coenzyme Q-10 (2.5mg), Pyridoxal-5-phosphate (2.5mg), Manganese (0.5mg), Copper (0.125mg), Selenium (0.025mg), Molybdenum (0.0125mg). Cell Advance 880 is recommended for use in dogs to support and maintain the immune system and to protect the dog from free radical damage. Cell Advance 880 is a non-prescription (OTC) product available as capsules. Give 1 capsule per 20 lbs of body weight daily. If giving more than 1 capsule, divide between AM and PM. This product is for use in dogs only. This product contains Quercetin. Do not use with blood thinners. The safe use in pregnant animals or animals intended for breeding has not been proven. If animal's condition worsens or does not improve stop product administration and consult a veterinarian. Store this product in a cool, dry place. Keep out of the reach of children and other animals. 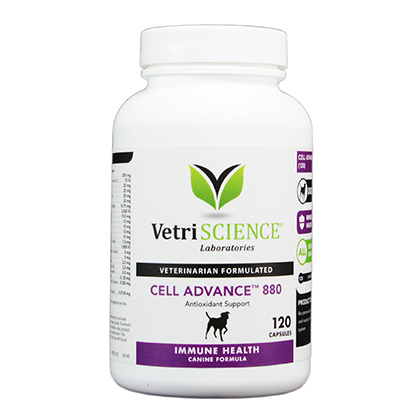 Cell Advance 880 is recommended for use in dogs to support and maintain the immune system and to protect from free radical damage. Cell Advance 880 should not be given to cats.